We carefully inspect the area to be paved for soil and terrain qualities and drainage capability and create a blueprint that factors in the expected traffic volume, environmental effects and future development. We excavate and grade the area to establish the desired drainage and grade. We place and compact an aggregate base course (ABC) to create a solid foundation vital to the long-term life of the pavement. We apply a specially formulated hot asphalt mix prepared onsite to create a smooth finish surface according to the customer’s needs. ADA compliant Line Striping is the final step with a freshly striped lot adding to the appearance and safety of your business. PermaStripe professionals have successfully finished thousands of projects from large-scale industrial, commercial and government projects to residential paving applications in Central Florida. Asphalt is tough, but it can degrade over time due to lack of maintenance, proper asphalt repairs overuse or simply living past its life cycle, usually between 15 to 20 years. We at Perma Stripe of Florida, Inc. are experts at asphalt repairs and we only employ professionals who are experienced specialists at asphalt repairs, patching, removing, or replacing asphalt. From pothole asphalt repairs, asphalt patching and crack sealing, to full asphalt removal and replacement, we can determine the most cost-effective and best long-term solution for your asphalt repairs project. If the sub-base of asphalt is severely compromised, then complete removal and new installation of hot-mix asphalt repairs may be your best bet and most cost effective asphalt repairs for the long term. If you just have a few cracks, then crack sealing or asphalt repairs patching is an economical and absolutely essential method of extending asphalt life when considering asphalt repairs. Pavement cracks should be repaired every year to prevent them from spreading, and will be part of the Perma Stripe asphalt repairs process—and to stop water from reaching and ruining the sub-base. Perma Stripe of Florida, Inc. has been in business since 1984. Located in central Florida. We service the greater Orlando area and specialize in asphalt paving, asphalt repairs, seal coating, parking lot repair,striping and maintenance, including asphalt patching, paving, thermoplastic striping, paint striping, and traffic signs. 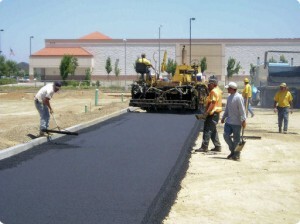 We are the proven experts at Orlando asphalt repairs and paving, Orlando seal-coating and Orlando parking lot repairs. Please call us at 407.814.7400 for a FREE Inspection & Estimate of your asphalt repairs project.